There is no comprehensive Partnership Act in South Africa. The law of partnership in South Africa consists of South African common-law. Without an agreement, you leave your interest in your business at great risk to being devalued by the actions of your partner. 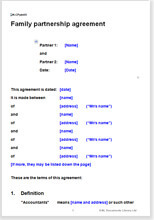 A good agreement must include paragraphs that set out in greater detail how your business will work.Many families or groups of friends enter into business with each other without a formal agreement because they feel that there is no need to formalise the relationship when there is a high level of trust between the partners.